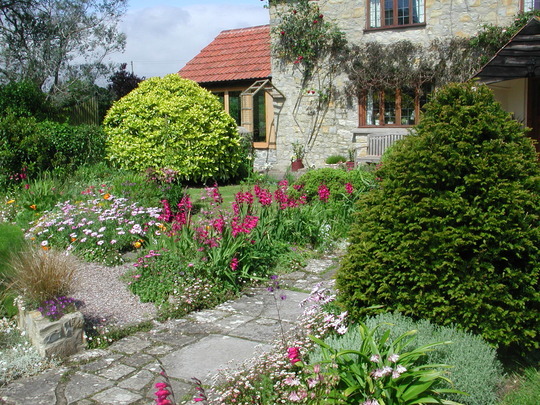 The front garden in May which has Byzantine gladioli - which I love - just as well, they do spread themselves! do Byzantine mind seme shade? I think they need sun, like most Gladioli. I agree with Mike C, a gorgeous settting and I love your path! It's very old and although we'd like to extend it right to the gate we can't because the limestone slabs are only available at Reclamation yards and are VERY expensive! Very picturesque. Would that be climbing roses on your cottage? What kind of shrub is the large yellow one? There are 2 climbing roses, a red and a pink - 'Albertine', plus three Clematis montana! The shrub is an Aucuba, not quite sure which variety. It's evergreen and a useful one for 'structure' all the year round. Good to know, thanks. I've already ordered clematis montana, waiting for delivery...how are yours attached to the wall? String, trellis or self clinging? Katcod - the Clematis and the roses are attached to horizontal wires. I tie the new shoots of the roses in with plant ties each year and the Clematis looks after itself now, having been trained many years ago by our predecesors. That's a lovely compliment - thank you. What a lovely, welcoming front garden. Beautiful house and lovely garden- you must have thousands of plants in there! Yes, I think you're right! Thanks for the lovely comment, Skillen. And it still looks wonderful to those of us meandering around the site three years later!! lol. Yes, me looking at your photo album too! Had to comment on this as I just love byzantine glads. Wish they seeded here too! Isn't it odd that they do in my garden, and not in others! Don't tire your eyes out, Karen...see you in about a weeks time...LOL. I love gladiola byzantine. They naturalize here in So Calif. Old House Bulbs carries the best bulbs. Mine do spread rather a lot. One day I might have to pull a few out! This photo is of species Gladiolus communis subs. byzantinus. See who else has plants in genus Gladiolus.